Sydney – October 17, 2007 – Altium Limited, the leading developer of unified electronic product development solutions, has announced support in Altium Designer for the SIMetrix/SIMPLIS power simulation system, a joint development between Transim Technology and Catena Software Ltd.
Altium Designer, Altium’s unified electronic product development system, lets electronics designers take a new approach to system design by bringing together board-level hardware design, embedded software development and FPGA-based system design within a single unified environment. This unified design approach allows board-level designers to exploit the potential of FPGAs as a system platform without the need for specialist FPGA skills. This reduces time to market and helps remove the barriers often found within design teams and the integration of their disparate toolsets. Power management and power supply design is a crucial part of nearly all electronic product design projects, particularly those involving devices such as FPGAs, which can require several independent power rails. 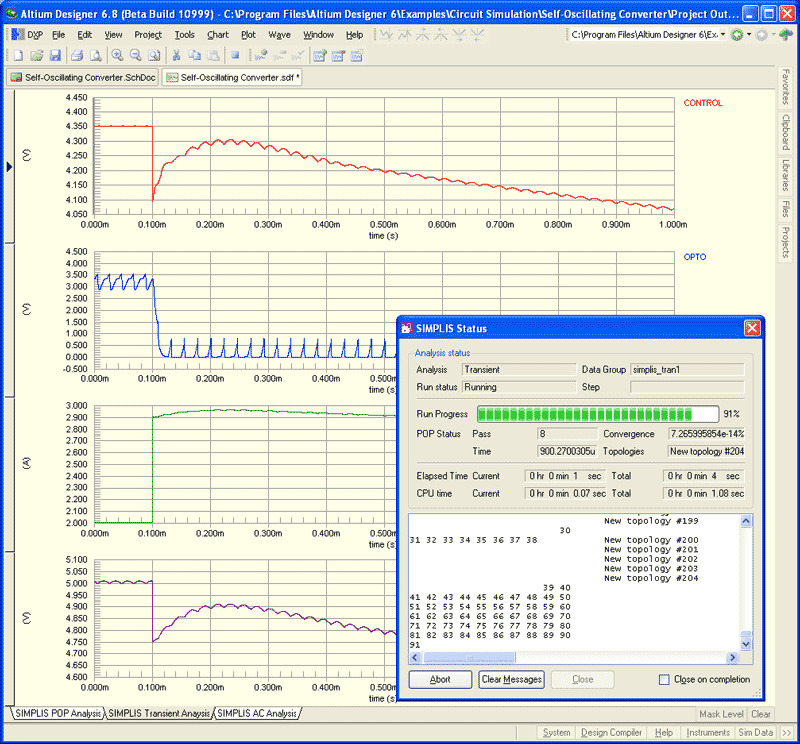 SIMetrix/SIMPLIS is a powerful simulation engine, which has been optimized to provide unmatched simulation speed of switching circuits for power supplies. In addition to using Altium’s in-built SPICE 3F5 simulator, engineers using Altium Designer can now make direct use of SIMetrix/SIMPLIS. On top of the speed advantages, SIMetrix/SIMPLIS combines accuracy and convergence which further supports challenging power system design. SIMetrix/SIMPLIS is invoked directly from the Altium Designer schematic editor. The standard Altium Designer SPICE component models are translated on-the-fly for use by SIMetrix/SIMPLIS. Components can be linked directly to SIMetrix/SIMPLIS models if desired. Results are displayed in Altium Designer’s powerful Wave display/editor for analysis and post processing, providing a completely clear simulation flow when using the SIMetrix/SIMPLIS engines. Altium Designer customers only need to purchase and install the SIMetrix/SIMPLIS version 5.3j product in order to make use of this new feature. Note to Editor: Screenshots are available upon request. Transim Technology’s SIMPLIS is the leading simulation engine for switched mode power supply design. The simulation engine has been rapidly adopted by leading power supply, computing and telecommunication equipment manufacturers in recent years and has become a standard for power supply system simulation and new product definition analysis. SIMPLIS is also the engine behind Transim’s world leading Design Centre technology for web based design, marketing and application engineering solutions. For more information please visit http://www.transim.com.